100 years ago, a major snowstorm enveloped the region with blizzard conditions. 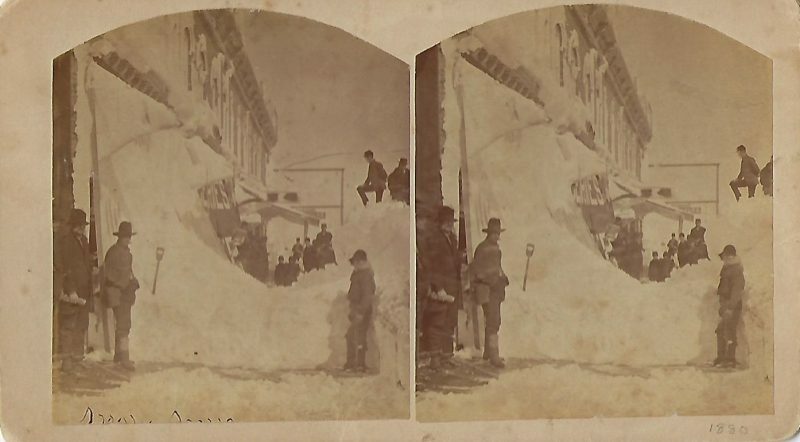 Several photographs, many of which were printed on postcards, were taken in the region to document the large amount of snow. 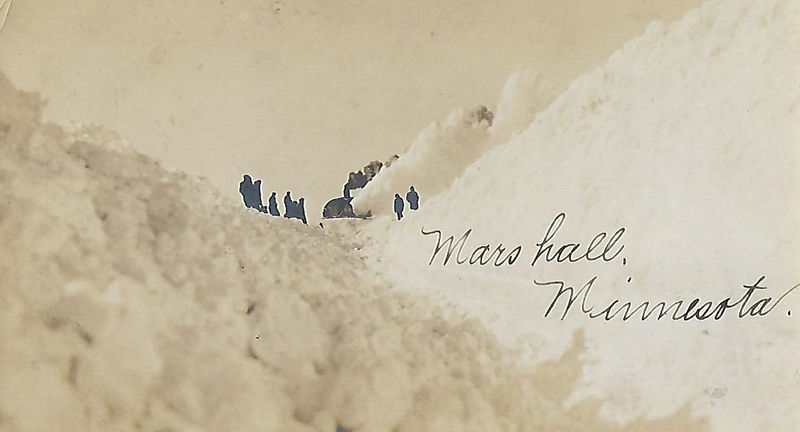 The museum has several postcards in its collection from the blizzard storm of 1909. The photograph featured this week was taken near Marshall and shows a rotary snowplow cutting through the mass of snow. The Blizzard Storm. One Exception, Worst in 28 Years. All Train Service Blocked, Telephone and Telegraph Wires Down, Train Stormbound at Granite Two Days. Great snow storms and blizzards were a fixed habit in the winter of 1880-81, Marshall was without train service for three straight months, and there was great loss of life and great hardship. Since that time Nature has been more reasonable, and the next big blizzard storm was in 1888. And last week appeared its next best counterpart, a genuine blizzard, which fortunately lasted but twenty-four hours, with another day of excessive cold and wind. The storm came from the southwest, and the territory covered the country from the Rocky Mountains to the Atlantic, and from the gulf states to the northern boundary. It was more severe in the southern and eastern states, where there was much loss of life and great suffering. Hereabouts we learn of but two severe casualties to humanity, a man named Patyn, from Grandview, who with his employer’s team were lost, and finding the buildings on the old Van Hee farm, fastened the team and crawled inside for shelter. He was so badly frozen that he died. The team remained hitched for nearly twenty-three hours, unblanketed, but were in no way injured. Over at Tyler, a man was badly frozen close to his own home, an account of which appears elsewhere. The principal damage in this state was to train service and telephone and telegraph service. Wires were down in all directions, and the service is still crippled. In this vicinity train service was suspended on the Northwestern from Thursday till Monday, and on the Great Northern from Thursday at midnight till Saturday evening. The Lyon County Historical Society is a non-profit, member-supported organization. For more information on membership, research, volunteering, or the museum’s collection, please contact us at 537-6580 or director@lyoncomuseum.org. Like our page and follow us on Facebook.